An assortment of spiral wood pin variants from The Hillman Group. 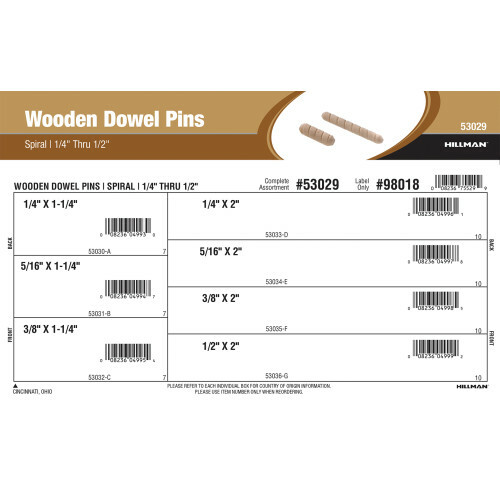 Spiral wooden dowel pins feature a spiral groove design that retains and disperses glue evenly for reliable holding power in crafting and home DIY projects. Variants included in this assortment range from 1/4" to 1/2" in diameter. Full assortment contains seven (7) refills comprised of Hillman item numbers #53030 - #53036. Included variants come in lengths of 1-1/4" & 2"